Can you think of a time when you really wanted something from your parents, but they chose not to give it? (Alternatively, do you have a similar story about your children wanting something?) What happened? Have you ever felt really disappointed when God didn’t answer one of your prayers in the way you wanted? What happened? 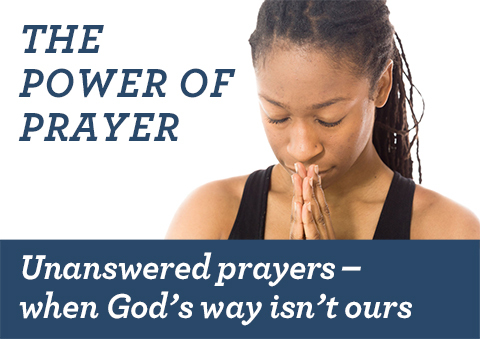 The following 6 reasons were given for why God might say ‘no’ or ‘wait’ to a prayer. Explain each in your own words: Unforgiveness – Matthew 6:14, wrong motives – James 4:3, unbelief – James 1:7, a lack of believing action – James 1:22, because of sin – 1 Peter 3:7 / to highlight sin – 2 Samuel 21, a lack of confidence to ask – Hebrews 4:16. If a person felt disappointed with prayer because some of their prayers weren’t answered as they hoped, how would you advise them? If someone had lost confidence in prayer due to past disappointments, what might be involved in their ‘journey of healing’, to become confident in prayer again? What is your response to God today regarding any prayers you have prayed in the past that he does not yet seem to have answered? Dear God, thank you for not only hearing all of our prayers – but for also answering them in the way that is best for both us, and others. While we often cannot yet understand all your reasons, we choose to trust you because you are clearly positioned to know more than we do. Thank you for being dependable. And thank you that we are able to come to you in prayer!